Your endpoints can be the weakest link in your network environment - and its hard to know every device that has access to your systems. Our solutions provide full visibility into a diverse mix of endpoints - desktops, laptops, servers, point-of-sale devices, and more. Identify vulnerabilities, detect and manage threats, apply patches, and maintain inventory from procurement to end of life. Discover and update a diverse mix of endpoints across an organization. Secure and service all network connected devices. Stop threats in their tracks. IBM BigFix provides advanced attack detection, investigation and enterprise-wide remediation in a single platform. With BigFix you can have real-time visibility and control across endpoints - however they are connected - to see, understand and act on endpoint threats fast. BigFix provides multi-platform support for over 90 different OS including Windows, Mac and *nix. It even works in remote locations with low or no bandwidth. Microsoft SCCM Endpoint Protection allows you to manage anti-malware policies and Windows Firewall security for client computers. Configure anti-malware policies, keep client computers up to date, and keep administrative users informed. Tanium, an up and coming leader, provides an endpoint protection platform that offers 15-second visibility to secure, control and manage millions of endpoints across the enterprise. Tanium allows you to learn what is happening across your endpoints with plain english query. 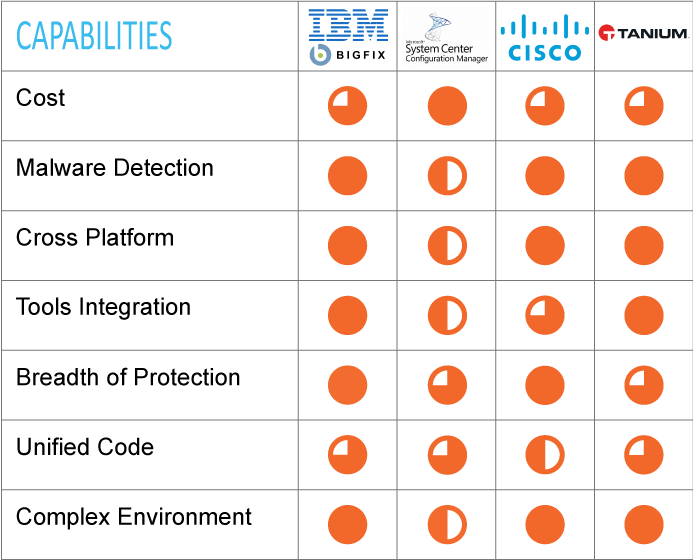 You can proactively inventory and remediate vulnerable applications quickly.